I love going wine tasting especially when the winery offers a food pairing to go with it. Sometimes a wine that is only so-so by itself really comes to life when paired with the right food. Wines can be paired with cheeses, different meats, and various fruits. 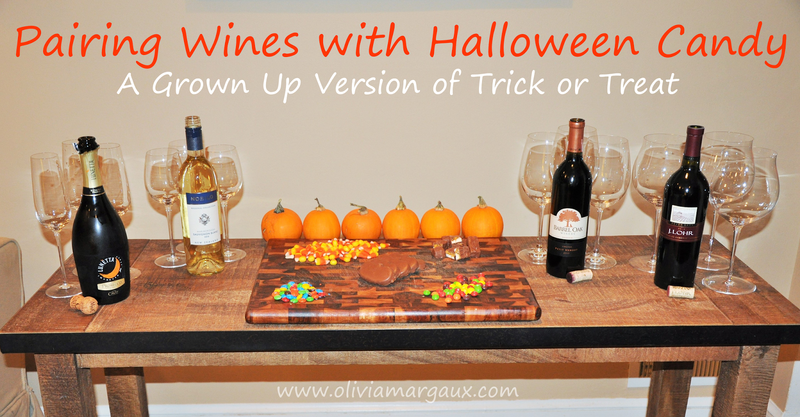 Because of wine's versatility, I thought why not pair it with different Halloween candy? Talk about a yummy way to get in the mood for the upcoming spooky holiday! Turns out, this isn't a new idea, and if you Google "Halloween Candy Wine Pairing" you will find lots of suggestions and options. But, I still felt pretty creative and decided to host my own small tasting. Since there would only be three of us participating, I kept the menu small featuring my four favorite varietals. 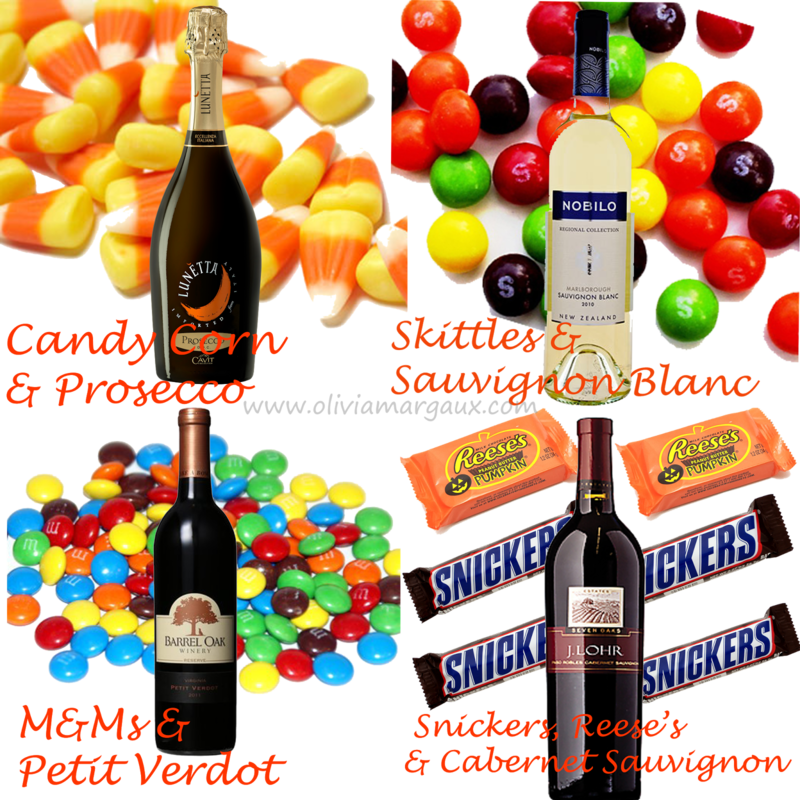 I then did some research to see what candies would pair best with my beloved vinos. All of the wines (minus the Petit Verdot) cost between $11-$14 dollars (so in Texas they would have been like $7-$10...damn you city prices). They are my go-to grocery store/weekday wines. The Petit Verdot was from our wine tasting adventure a few weeks ago and we decided to pull it out for the special occasion. Lunetta Prosecco with Candy Corn: This sugary corn is probably the low man on the Halloween Candy totem pole. But, since it is so synonymous with the holiday, I felt like it had to be featured. Luckily, sparkling wines and champagnes pair well with most sweets. They are the O Positive of the wine world. Nobilo Sauvignon Blanc with Skittles: This fruit forward wine pairs nicely with a fruity candy like Skittles. Other options would have been Swedish Fish or Gummy Bears. Barrel Oak Petit Verdot with M&Ms: Before moving to DC, I had never tasted a Petit Verdot. But, the grape grows well in Virginia making it a popular varietal among Virginia winemakers. Petit Verdot's concentrated tannins and dense fruit notes compliment sweetness of the M&Ms. J. Lohr Cabernet Sauvignon with Snickers & Reese's: This is my favorite grocery store Cabernet. Josh and I buy it so often that we should just start purchasing cases. Cabernet brings out the flavors of nuts like the roasted peanuts found in Snickers and Reese's. I couldn't pick between the two so I decided to feature both. Going into the tasting, I assumed that the Cabernet with Snickers & Reese's would be my favorite. But the overall consensus was that the Petit Verdot and M&M's pairing was the clear winner. They went so well together. Although we didn't hate it, the Sauvignon Blanc with the Skittles was the least favorite. While it wasn't horrible, we just all thought they were better enjoyed separately. Oh my goodness, I have no idea how I missed this but I am bookmarking it for next year! What a GREAT idea!!! !